Now that the Golden Lampstand is lit, walk with me to the opposite side of the Holy Place to the Table of Showbread. It is made of the same material that we have become familiar with since starting this study – shittim wood overlaid with pure gold. The shittim, or acacia wood, because of its durability, symbolizes Jesus’ indestructible body while the gold symbolizes His divinity. He was all Man yet all God! On the Table are twelve loaves of bread – flat cakes set in two rows of six each. This bread is also called the bread of the Presence or the bread of faces. There is much symbolism here, so let’s stop awhile, for here you will have another divine encounter with our Saviour. This pattern of two rows of six is repeated in the garments of the high priest. On his shoulders were two onyx stones and on each stone the names of six of the tribes of Israel were engraved. "And you shall put the two stones on the shoulders of the ephod as memorial stones for the sons of Israel. So Aaron shall bear their names before the LORD on his two shoulders as a memorial." – Exodus 28:12. The high priest was a representative of the presence of Jesus Christ. Isaiah prophesied of Jesus in this way.. The number twelve represents governmental perfection. There were twelve tribes of Israel, twelve disciples, twelve foundations in the New Jerusalem which had twelve gates and twelve pearls. The high priest bore the names of the twelve tribes on his shoulders. Jesus, our Great High Priest, bears you and me on His shoulder. He is the Good Shepherd, carrying you when you are weak, or straying. He is your Husband-Redeemer. Lay your head on His shoulder and be comforted. He bore your sins, and bids you to give your burdens to Him. What a Saviour! When you eat something it becomes a part of you. You can no longer separate the thing eaten from your being. In other words, there is an intimate bond that develops between you and the food. Jesus is the Bread of Life. He is the Showbread on the Table! The next time you receive communion, eat the bread knowing that you are receiving the power that is in the Body of Christ Jesus – the Body that bore all your sins. 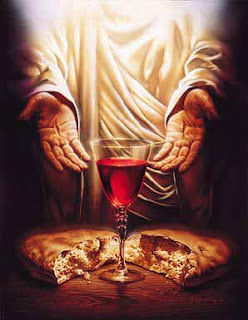 Drink the wine/grape juice knowing that you are receiving everything that the Blood of Jesus always did from the beginning – the Blood that never loses its power; the Blood that cleanses, heals and restores. Now mind you - I'm not talking about a religious ritual that produces no power. I'm speaking of an intense spiritual encounter - one that I have experienced personally - that can manifest in physical, emotional and spiritual healing. Eat His Body, drink His Blood, and watch what happens as that supernatural Body and Blood become one with you!! The Table of Showbread in Moses’ Tabernacle is an awesome picture of the divine intimate communion that you and I can enjoy with our Lord and Saviour Jesus the Christ today!! Wow,,what a Awesome blog you have Sweetie.. I feel sure God directed me here to find you.. Of course He ALWAYS knows what He is doing ..
And His will is ALWAYS Perfect.. I'd googled dsome images for a post I was trying to add some pics to and in the images was a pic from your post so i clicked it and here you are~~~A wonderful woman who shares God soooo beautifully with the world!!! I have 2 blogs the one I devote totally to words and pics of Christ etc. you need to click on the image of Christ in the right sidebar..
That is if you ever get a free minute.. I do share about Him in both but the one is for worship and a Spiritual Sundays blog I join on Sondays.. When I take the Lord supper I always try to meditate on him and only him. I try so hard to clear my head,sometimes this is not an easy task for me. Thank-you for sharing this post today.